Residents living around the United States Marine Corps Air Station (USMCAS) Futenma in Ginowan City still have poor reception of terrestrial digital broadcasting due to flight activities. According to a survey that the Okinawa Defense Bureau conducted last year, it was confirmed that residents in about 900 buildings housing about 2000 households had poor reception of terrestrial digital broadcasts in an area including the three districts of Nodake, Futenma and Aragusuku, north of the airfield runway. 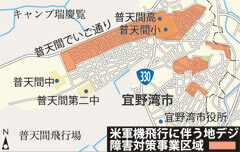 In June, the Ginowan City Office decided to provide cable television access to the households with poor reception within the areas indicated by the survey, with the cost covered in full by the Ministry of Defense. However, the City Office has also received complaints about reception of digital terrestrial TV from outside the stipulated area, so urgent measures are needed to deal with this. In these areas, viewers can generally watch TV normally but, they experience noise or the television screen goes black when an aircraft flies overhead. The full payment for the installation of cable television services aims to eliminate interference to reception. Based on the Law Concerning the Improvement of Living Environment around Defense Facilities, the Ministry of Defense will pay the total cost for the cable installation work, a sum of about 98 million yen. Registrations will be accepted from residents of the stipulated area up to September 30 at the Ginowan City Office public relations section for the base. Telephone assistance is available on 098 (893) 4411 (extension: 310 & 312).